Looking for an easy science investigation? Here is one with something you probably have around Halloween- all you need is your leftover jack-o-lantern. Download the free printable pumpkin observation sheet below and kids can learn about life cycles and decomposition in a clear and simple way. We've also included a book suggestion so that you can also include some great children's literature while you're at it! 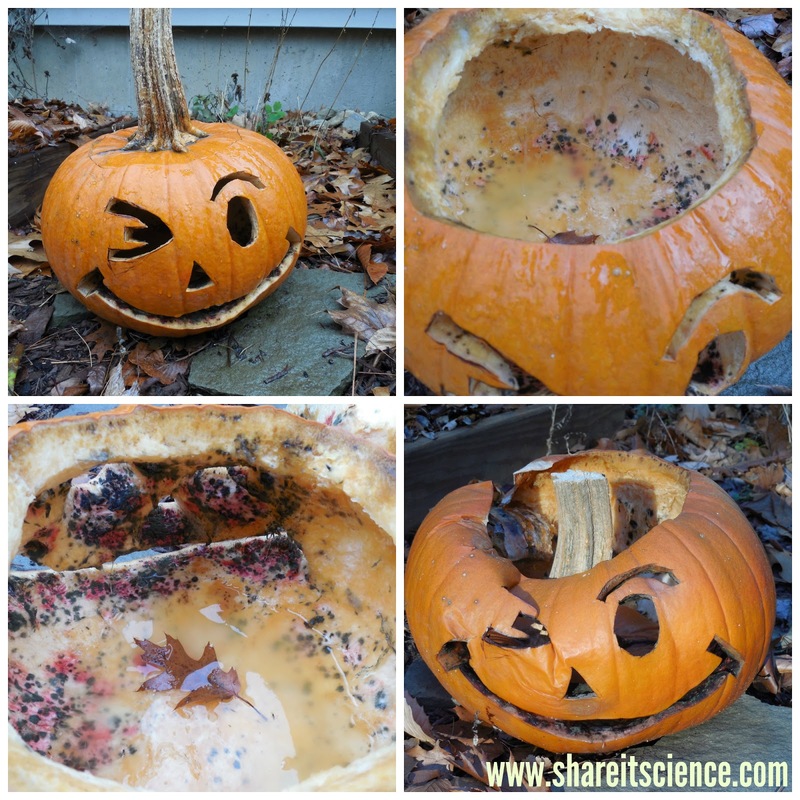 Try this easy pumpkin science experiment at school with your students or with the kids at home. Decomposition is such an important ecological cycle. 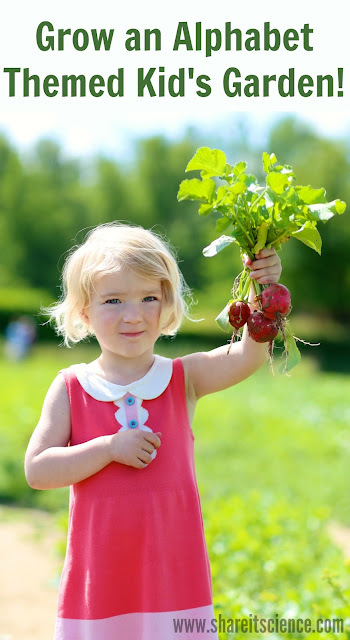 One of the best ways to explore it with children without getting gruesome is by learning about composting. This October you can turn the inevitable process of your Halloween Jack-o-lanterns rotting out into a science investigation. This post contains affiliate links, meaning I may receive a small commission (at no additional cost to you) if you make a purchase through a product link. Please see disclosures page for more details. First, inspire kids by reading the picture book, Pumpkin Jack. In this story, a boy named Tim carves a Jack-o-lantern and names it Jack. He enjoys watching Jack's glowing face in his room each night, until Jack begins to go bad and Tim's mom makes him get rid of him. Tim puts Jack out in the garden and watches him continue to decompose and change throughout the seasons. 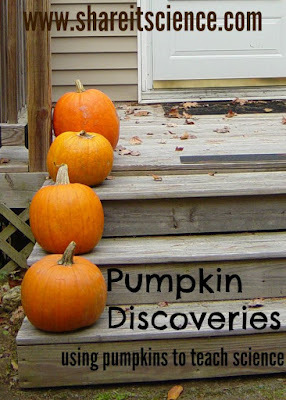 You can observe a pumpkin and how it changes as it decomposes too. Every few days make an observation of your pumpkin. You can take a picture like I did, or draw what you see. Make some notes. You can use this printable observation sheet to keep track. If you put the observation sheet on the refrigerator or a bulletin board where you will see it often you can observe your pumpkin throughout the fall and maybe even in the winter and spring. What color does your pumpkin change? Does it get moldy? What does it look like? Did you get a frost? What happens to your pumpkin after a frost? What's happening to the pumpkin during this process? Decomposition is nature's way of recycling nutrients. Exposure to the elements begins to break down the pumpkin's cells and eventually decomposers like worms and other invertebrates, mold and bacteria go to work breaking the pumpkin down until eventually it turns into compost. Brave scientists will want to investigate that mold and bacteria more closely. You might even want to see if you can grow some more to observe. To do so safely, get a bacteria science kit. Children can learn more about the fabulous creatures that work to turn living things back into soil at Growing with Science. 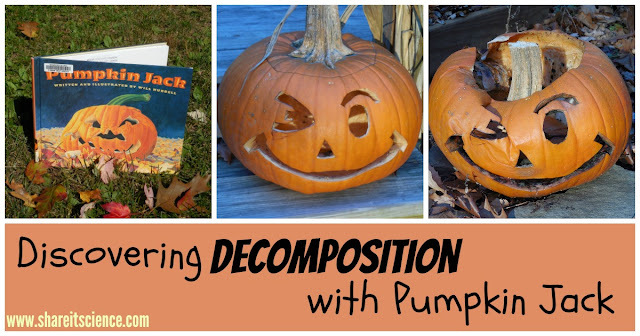 For another great picture book about pumpkin decomposition to supplement this post, check out this link. Add to your science library with these children's books on compost and decomposition. Want to try building a worm compost bin? You can use it all year long. Find out how here. Not sure what to do with that surplus of Halloween candy? Try these science experiments with candy. Oh, thank you! I always forget to compost our pumpkins after Halloween...now I can do it on purpose in the name of science education. 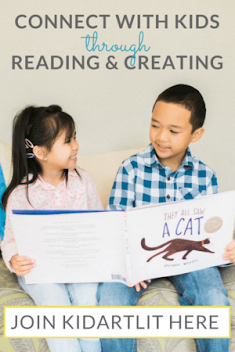 :D Seriously, though, I think this will be a great book and activity to share with my son. Thank you! We usually leave them out a little too long too, but now I try to remember to move it where we can still watch it, but it's okay if it gets a little too mushy! :) I hope you enjoy the book. Poor Pumpkin Jack! lol! Our pumpkins usually don't get too far into decomposition before they serve as a tasty meal for our neighborhood squirrels! The squirrels do love them. One year when I planted pumpkins with my students the squirrels chewed a hole in one side and then the other side. It was like a pumpkin tunnel! The food chain is another aspect of nutrient recycling and the food chain to think about. We unintentionally watch our pumpkins decompose every year ;) haha.But it IS always fun when an actual pumpkin plant comes up in the compost the next year. Some of the best science experiments start out as unintentional I think! :) We always have compost plants too! I have never heard of this book, but we will be reading it this year. Can't wait to save our pumpkin and watch it decompose. It's a sweet little story. Have fun with your pumpkin! We threw our pumpkin in the garden last year and watched this process. My kids were fascinated. I can't wait to try some of the suggested extensions that you mentioned this year. What a fun activity. We did this with ours last year. This year we are on holiday for Halloween, so I am not going to have any. It is fun, as it never happens the same way twice. Have fun on holiday! We love watching our pumpkins too. I loved how you actually had a name for him though... Pumpkin Jack my kids will love that idea. I didn't even know that book existed... We are definitely going to have to find it to read. And then watch the decomposition of our own pumpkin. 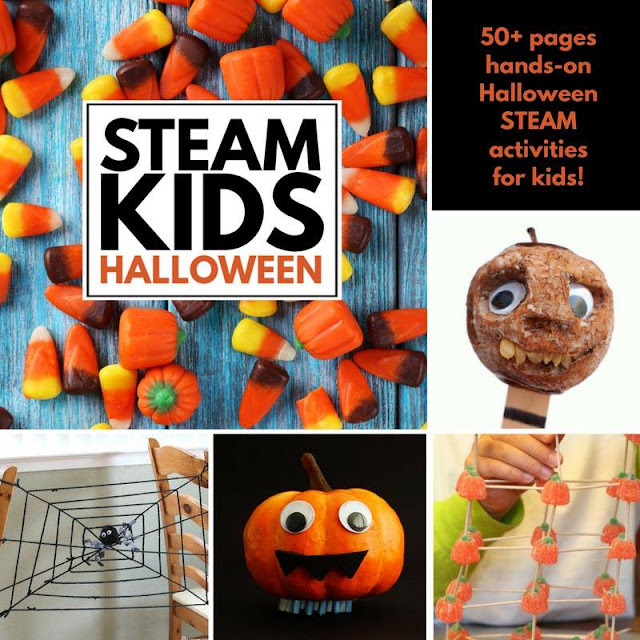 What a great science activity for fall. What a fun activity! I learned the hard way to always put a plate under the pumpkins before you let them decompose. They make horrible stains! YES!! I'd recommend moving it to where it will remain, whether it is in the garden, compost, dormant flower bed, or even on top of a garbage bag. I've more than once left them just a little too long and ended up trying to scrape them up with a shovel. Decomposition...it really works! So gross :) And yet I know that my kids would be absolutely fascinated by this. So much of science falls into that "gross, but cool" category. Your kids will love it! Great reminder, so we will go over the process as we watch the changes this year. I always wanted to do this. It is one of those things that probably happens and no one stops to think much of it. I really didn't think about doing this until leaving our pumpkins out too long became a teachable moment. I love when you can take learning outside of the pages of a book and into reality! I am eager to see if our young chickens will enjoy our old pumpkins this year! Me too! We used to always give our chickens our old pumpkins. It will be another fun process to observe- what parts do they eat? What parts do they leave behind? etc. I wonder if the outdoor temperature has much of an impact on the rate of decomposition? We have some years with warm Halloweens and others with cold nighttime temps. Love this idea -- what a great way to take advantage of a learning opportunity! I think that looking at the temperature would be really interesting, because I'm sure it has an effect. That would be a good investigation over the course of a few years (for someone more organized than me!). I know when it frosts and then warms up that really speeds things up because the ice has broken up the cells, just like putting veggies in the freezer can make them mushy. This is fantastic! 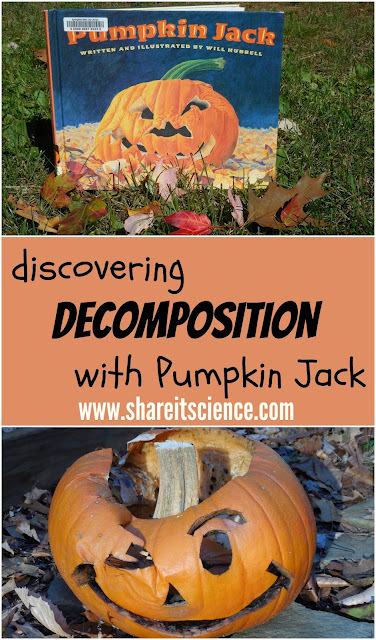 My kids would totally enjoy watching the decomposition of Jack. My kids are always fascinated by our decomposing pumpkins! It really is a science experiment. Ours just happen to be left out until December 1st. Ha! It would be an interesting comparison experiment- how much longer can a pumpkin stay preserved when it is "water resistant". Water is a major contributor in the process of decomposition! Have fun with your pumpkins! Sounds like a plan. It always happens a little different, which is fascinating to see. Have fun! Such a great idea! I believe we just checked that book out of the library too! What a great idea! We don't celebrate Halloween so won't have a pumpkin to use, but I'm definitely getting the book out to have a read! It's still a great little book, you'll enjoy it, and teaches about decomposition regardless. Enjoy!